Week two is in the books and I’ve got to say, this one was tough. Week one I had lots of excitement and purpose and then week two all of that started to fade. I started to look at this challenge as a negative instead of a positive and I started to focus more on what I couldn’t eat instead of what I could. We used our drink night on Saturday night–and we definitely went over the recommended limit. I learned on Sunday that the challenge recommends only 4 drinks on drink night for a reason. It is very painful the next day. My brother, sister in law, and nephew were in town and we decided to take them out for dinner. Blurry, dark, and I’m sure successful yoga being done here. A few beers there, then a few glasses of wine at home, and then a few hot toddy’s later, I was toast. Not my smartest decision, but we did have a great time! I paid for it on Sunday and then swore off drinking altogether (or until next Saturday). 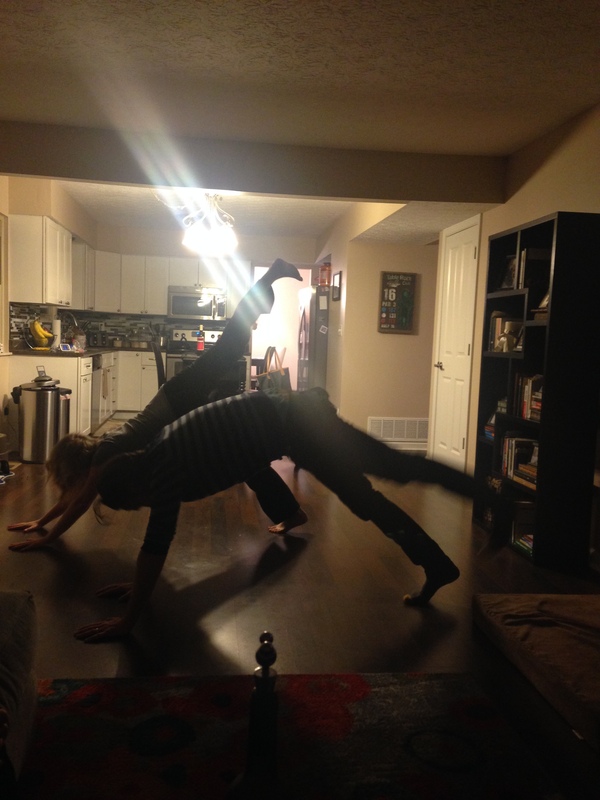 The drinks did lead my brother and I to practicing yoga in the living room around midnight–so not all was lost. Ryan and I would drink wine probably 4 nights a week. Just a glass or two, but we were pretty consistent about it. It was a habit we knew we needed to break not only because it started to get expensive, but also because it guaranteed us evenings on the couch watching TV instead of doing something more productive. Also, it wasn’t good on the waistline even though we all know wine is just grapes and nothing more. Back to the food. Since Sunday was mostly spent on the couch because of above hangover, pizza obviously came into the picture. We used this as our treat meal for the week. The pizza was delicious and absolutely what I needed to start feeling normal again. No regrets on that meal. Monday morning rolled around and I stepped on the scale only to be disappointed. The first week I had lost almost 5 pounds, and this week, I gained back 2 of them. As I mentioned, the first week I was excited and planned out each and every meal–I even wrote down everything I was eating. Week two, that all kind of died down and I got lazy. I still ate pretty good, but I snacked more and didn’t watch my portions as well. I also only got in 2 workouts. So here we are in the last and final week. I know I’ve learned a lot through this challenge. I know how to better control my grain intake and my sugar cravings, and learned that not every meal needs to include a processed carb. I’m re-energized this week and hope to finish with a bang. Cheers!